Congratulations, 2013 GRANDparent of the Year Honorees! GRAND Magazine Proudly Announces the 2013 GRANDparent of the Year and Runners-Up! Choosing only one winner and nine runners-up from the many deserving nominees for this special honor was truly a labor of love. Reading about these amazing grandparents inspired and moved us. We gratefully applaud the nominees, sincerely thank those who sent in nominations, and enthusiastically congratulate the winner and runners-up of GRAND Magazine’s 2013 GRANDparent of the Year award! 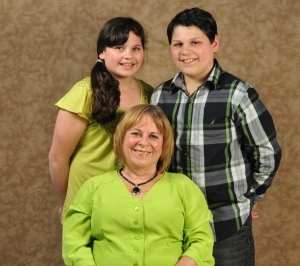 Meet Paula Kaminski: 2013 GRANDparent of the Year! Paula has been in our program [for grandparents raising grandchildren] since it began seven years ago. She is a powerful example to all grandparents raising grandchildren. Paula is one of the most loving and compassionate women I have ever met. When her addicted son and his girlfriend were incarcerated, she immediately took action to keep her three grandkids in her protection. The children had been badly traumatized, and the idea of placing them with strangers was not acceptable to Paula. She had to give up her nursing career to care for them and to fight the ensuing battles with the courts, DCF, her family, and everyone who felt she was too old, too poor, too sick, or whatever other invalid excuse to keep her from maintaining custody. Unfortunately, the youngest child was in need of more clinical care and psychological attention than this new family could manage. She was ultimately placed in a more appropriate situation. Despite the heartache it gave Paula, it was the best option for the little one and for her older twin brother and sister. After months of court appearances, unhelpful case workers, misinformation, lack of resources, and letters to state legislators, Paula eventually adopted the children. It’s been over five years now, and David and Mariah are two of the sweetest, smartest, well-adjusted kids you could meet!Paula also helped to get legislation passed to form a grandparents commission in Massachusetts and to initiate a successful grandparents’ support group. She is humble and devoted. Her kids love her, as do we. This kind of dedication deserves to be recognized. Helen is an amazing grandmother. She takes her grandson, Shawn, to and from school every day and takes care of him until his mother (her daughter, Margie, who works two jobs) picks him up. Helen and her husband, Louis, have raised their other grandson, Chris, since he was 16 and decided to move in with them to be closer to his friends. Helen has been a helping hand for their family and her grandchildren, Crystal, age 10, and April, age 17, who lost their father. I believe Helen deserves the Grandparent of the Year award because she has inspired me in so many ways to be a more caring and helpful person. She has a huge heart, and I have felt like a part of the family ever since I met her one year ago. Jackie Nezezon: Chris has never waivered in her determination to make sure her grandson has contact and bonding with both sides of his family. He is only 4 years old, and lost his mom to a vicious attack in 2009, when he was 6 months old, and then lost his dad to a car accident in 2012. Since the mother’s death, the Gardiners have been struggling to have visitation. He was in the care of his father’s mother when the father was killed, and she passed him over to her daughter to raise. Chris has a court order of visitation signed by her and the father that is still in effect, but the aunt has circumvented that by barring Chris from the aunt’s property, claiming she will be charged with trespassing. The legal system is so slow, it’s unbearable at times. Chris has instructed her lawyer to make sure our grandson has some kind of legal representation. At this point, he doesn’t even have a legal guardian and is living in a very unstable environment. I honestly don’t know where Chris pulls her inner strength from. Chris is the cornerstone, strength, and faith of our family. Chris truly believes that “family takes care of family” and has never waivered in her determination that we will soon be legal guardians of our grandson/great grandson. Sam Stephens: Chrissie has been my best friend for over 42 years. Together, she and her husband have raised five children. On February 7, 2009, her daughter gave birth to a wonderful baby boy, and Grandma Chrissie was there from birth for her handsome grandson. On September 19, 2009, the family lost their daughter to a brutal murder, leaving Chrissie’s grandson motherless. She and her grandson became very close. In November 2012, her grandson lost his father to a car accident, leaving this child an orphan at 4 years of age. My friend Chrissie is going for custody of her grandson; he is so very special to her. He loves her dearly, and if you could see them together, you would see they share more than just the unconditional love of a grandmother and grandson. She goes above and beyond to support this precious little boy in his grieving for his parents and the love they share for one another. To see the love this little boy has for his grandmother would melt anyone’s heart. I do not know how my friend managed to cope and move on with the loss of her daughter and fighting so hard for her grandson’s rights. But I do know she is the most wonderful grandmother to this precious little boy and deserves to be Grandmother of the Year. My heart goes out to this family. Shirley is an amazing grandma who has taken on the job of raising four special needs grandchildren who are the byproducts of her daughter’s addiction. Each grandchild is an “alphabetic soup” child with FASD, RAD, ADD, sensory issues, etc. Shirley works and just completed her education. Shirley brings the children to CANGRANDS kinship camp each year and is lovingly referred to as Shirley and the “tag-alongs.” Shirley also has volunteered to oversee the teens at this year’s camp and has planned out many exciting activities for them. I personally feel Shirley is one of the best ladies I know, and she is a GRAND grandmother to the tag-alongs! Loma is a wonderful grandmother with many grandchildren, including a granddaughter with special needs, and the love Loma gives is magnificent. Loma has sacrificed so much in her 71 years that she should be recognized for the silent love she has expressed without realizing what an example to others she has been. I love this lady, and so do the people she comes in contact with, whether it is counselors, doctors, clinicians, or clerks. They all can see the love she expresses for her “special” grandchild. Loma goes way beyond the call of duty, like many grandparents have. I would love to leave this legacy to her with the realization that she is a perfect grandparent to win this award. Not only would she be granted this honor but I know she would accept it in honor of all grandparents who have gone the extra mile. This honor would let others know that people are watching from afar and acknowledging grandparents’ efforts. My mother should be Grandparent of the Year. She is always involved in her two granddaughter’s lives while working full-time and even going to college. She always makes time to have play dates, and whenever we need last-minute babysitting, she is a phone call away. She always gets calls from my girls when they do something they can’t wait to tell her, like going on the potty and losing teeth. She always calls to get updates on doctor appointments, birthdays, and just to say hi. My girls love their Oma and love spending time with her! My grandmother Queen Ross is truly a gift sent from God. I was just 11 when my birth mother died. My grandmother took my siblings and me in. This wasn’t the first time she had taken us into her home. I can say we stayed a total of two full years with our birth mom. My grandmother was a soldier. She did not want us to split up or be in foster care. So she walked us to school, then caught two buses to get to her job. But this is only one reason I would like to honor her. I had just turned 21 years of age when my aunt, my grandmother’s oldest living daughter (since my mom died), Yvonne Ross, was diagnosed with cancer. She died six months later, and now my grandmother was faced with four additional children to raise. My grandmother used all of her resources to feed and clothe us. She worked day and night to keep us safe and off the streets. I remember searching for a job, and she would always say, “Shakeila, shoot for the stars.” She believed in me when I didn’t see the value in myself. She raised a total of 16 children, on an $8–$13 per hour income, for 40 years. She is my hero, my strength, and my encourager. Because of her, I am shooting for the stars. I pray that you consider my grandmother Queen Ross for this award. My daughter gave up her comfortable life and her job to take on the job of raising her three grandchildren. She has them in sports and activities that are good for them. She is on the run constantly, going from dance to the ball field. In the fall, she takes them to football. The children have some problems, and she also takes them to counseling. I applaud her for all she has done for her grandbabies and for the kind of life she is giving them. Her unconditional love and support for her grandchildren goes above and beyond. Although Louie has grandchildren of his own, he also serves as a volunteer in the Foster Grandparent Program, where he is “Grandpa” or “Mr. Lou” to 25–30 elementary age students. He serves as a positive role model and tutor to children who are struggling to succeed in school. Louie has an uncanny knack for reaching even the most withdrawn child, often using his artistic talent to literally “draw” the child out of his shell. Parents and teachers alike sing his praise as they witness these children improve grades, behavior, and socialization skills. Louie takes his commitment very seriously and at one time tried to continue his work from a hospital bed when recovering from heart surgery. Louie is a grandparent, in the truest sense of the word, to many, and he is very deserving of this award. Barbara Walton has been a passionate advocate for grandparent caregivers. Ms. Walton and her husband were caregivers to their granddaughters. Although their caregiving roles were unexpected, Mr. and Mrs. Walton rose to the challenge of caring for their granddaughters while providing support and guidance to their son. Mrs. Walton became an advocate for grandparent caregivers through her work at the New York City Department for the Aging Grandparent Resource Center and as a member of the Emmanuel Baptist Church in Brooklyn, NY. She helped create and co-lead a support group for grandparent caregivers at the church. Ms. Walton has spoken about her experiences in caregiving in various conferences and presentations throughout New York City. She is passionate about informing caregivers of their rights while maintaining a quiet, calm demeanor. She continues to raise her granddaughters (now in their early twenties) and a 2-year-old great-grandchild. Learning to Have A CAN-DO Attitude!